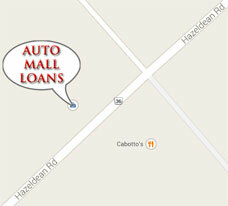 A used car loan is the second major loan, next to a house purchase, that you will ever apply for. The interest rate varies from anywhere from 4.99% to 29.9%. It all depends on your credit history and current monthly gross income as well as current monthly payments you are making on any existing loan. At Auto Mall Loans you have the option of getting a fixed interest rate for your used car loan or a variable interest rate for your used car loan. With a fixed interest rate, your monthly payment will stay the same throughout the terms of the loan. This means that any change in prime interest rates will not affect your monthly payments on your used vehicle loan. With a variable interest rate, your rate will be lower than the fixed rate, but any change to the prime interest rate will affect your monthly payments. This means that if the prime interest rate goes up, your monthly payments go up and if the prime rate goes down, so do your monthly used vehicle loan payments. An Auto Mall Loans credit specialist will go over all these details with you and explain the benefits of each type of interest rate. Give us a call now at 613-686-3962 or fill out our on-line vehicle loan credit application so that we can help you today!